The new United Nations Youth Strategy "Youth 2030" was launched this week as world leaders gathered for the 73rd session of the United Nations General Assembly. This comes at an opportune time, as Africa has seen an increasing proportion of young people, often known as the youth bulge, in the last few decades. This bulge is expected to continue, with approximately 60 per cent of the world's anticipated population growth by 2050 projected to occur in the region. 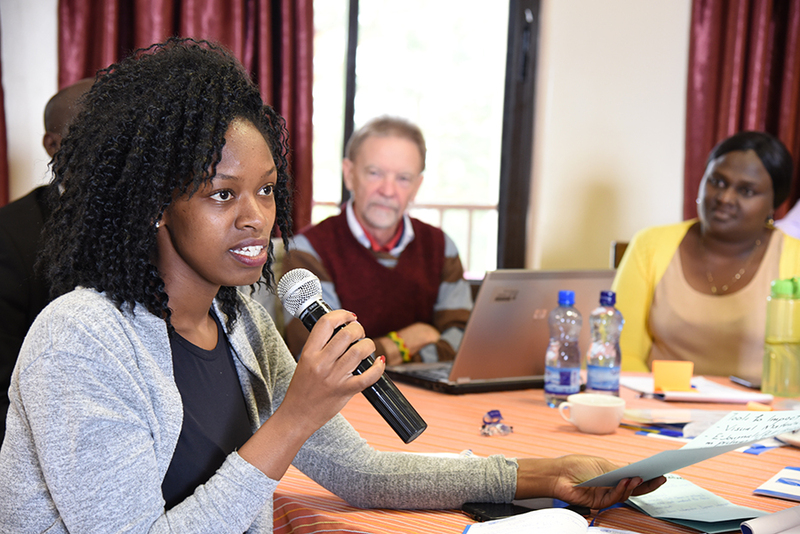 Primrose Kibirigi, national UN Volunteer with UN Women in Uganda, makes a pitch for better advocacy for volunteerism for peace and development during the UNV East and Southern Africa capacity development training in Nakuru, Kenya. Recent studies show that more than 200,000 African immigrants cross the Mediterranean Sea to flee wars and poverty in pursuit of better opportunities abroad. In a similar manner, youth can easily be influenced by extremist groups. Studies have shown that at least 27 per cent of youth recruited in terrorist groups in Africa did so for economic reasons, and 13 per cent for lack of better opportunities. All-inclusive strategic collaboration is key to finding lasting solutions. The United Nations Security Council Resolution 2250 on the inclusive representation of youth notes that a lack of leadership opportunities, protection and support for young people leave them open to a wide range of undesirable influences, including antisocial forms of engagement. According to UNV’s 2018 State of the World Volunteerism Report, such conditions of conflict and poverty that leave communities desperate and vulnerable allow opportunistic criminal or extremist groups to gain a foothold among youth. United Nations agencies and development organizations can address this by partnering with national and local governments to enhance youth involvement in volunteering. Volunteering opportunities, through promoting inclusion, provide the much-needed voice, agency and capacity to vulnerable youth. Such opportunities also help young people develop their professional and personal skills, while unleashing their boundless energy and creativity. Allowed to play a positive and constructive role in society through youth volunteering, they can make a major contribution to sustainable development, social cohesion and stability. A study undertaken in Kenya by the State Department for Social Protection, for instance, indicated that Kenyan volunteers contributed a total of 669,630,288 hours to the economy in 2016 translating to about 3.66 per cent of gross domestic product. UNV has been engaging with youth since its inception in 1970. In 1976, the United Nations General Assembly specifically mandated the organization to promote and advance the role of youth in development through volunteerism. In the 2012-2017 UN Youth Strategy, the United Nations Secretary-General called for the creation of a United Nations youth volunteer programme under UNV. Member States further confirmed UNV’s mandate to promote volunteerism in United Nations General Assembly Resolution 67/138 Integrating volunteering in the next decade, adopted on 20 December 2012. In response, UNV developed a detailed analysis of its youth engagement strategy detailed in the UNV Youth Volunteering Strategy: 2014-2017, and as a result developed the United Nations Youth Volunteer Programme to scale-up existing initiatives and introduce special measures to ensure that young people are utilized and empowered in ways that best cultivates their abilities and potential. For more than four decades, UNV has directly mobilized national and international youth as on-site UN Volunteers and UN Online Volunteers. UNV has also provided technical and financial assistance to regional partners in the process of designing and scaling-up their own initiatives for youth volunteering, such as the Volunteers Programme of the Economic Community of West African States (ECOWAS) and the African Union’s ‘Youth Volunteer Corps’. Through actively engaging host governments, UNV is also helping set up legal and policy frameworks and programmes specializing in youth employment and volunteerism and mobilizing young people to work towards the achievement of the development goals. In the African region, 11 per cent of all volunteers engaged in the last three years werein the youth and youth university categories. Youth embracing these opportunities not only benefit from the great exposure, but are also exposed to the global context in their disciplines and gain a competitive advantage in their career growth. The new UN Youth Strategy is aimed at scaling up global, regional and national actions to meet young people’s needs, realize their rights and tap their possibilities as agents of change. With the "Youth 2030 Strategy" projecting renewed energy and commitment by stakeholders across the board, Africa's youth bulge is the much needed catalyst for accelerating the contintent's sustainable development.